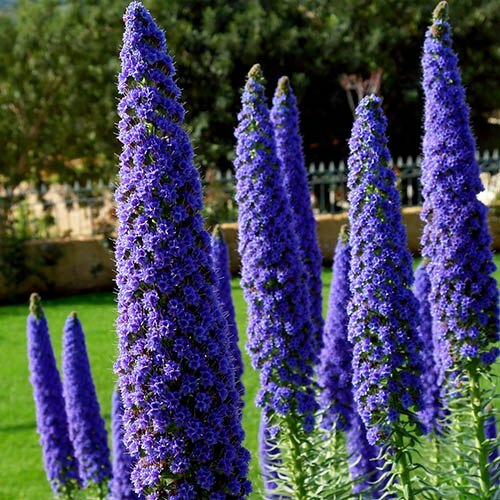 A truly dramatic garden plant, it produces the most spectacular indigo-coloured flower spikes seemingly from nowhere in summer. Despite its common name of 'Pride of Madeira', it is hardy in the UK down to -5C. Truly spectacular biennial shrub and one of the plants most favoured by bees that you can grow. Supplied as an over-wintered plant in a 2L pot, between 30-50cm tall, ready to flower in its first summer. A truly dramatic garden plant, a close relative of borage, it produces the most spectacular tall flower spikes seemingly from nowhere in summer. Despite it's common name of 'Pride of Madeira', it is hardy in the UK down to -5C or so, particularly where it is drier in winter. It is biennial, so needs one cold winter after germination to flower - so these plants will flower in their first year and beyond. E. candicans will grow to around 1m (3ft) in its first year, then in its second, it produces its magnificent flower - in milder areas the plants keep growing all year around and, after a frost-free winter, you will see enormous flower spikes. Young plants can be damaged by frost, and the leaves are easily blackened by cold winds so protect seedlings and one-year old plants if frost threatens. Supplied as an over-wintered plant in a 2L pot, between 30-50cm tall, ready to flower in this first summer.